According to the LA Times, California is drinking up its last year’s supply of water. In California, it’s easy to gaze out at the beautiful Pacific (assuming you’re near the coast) and feel as though our current state of drought is less than severe. Truth is: though the majority of our earth is composed of water, only about 1% of it is available for human use. As a community, it’s important that we work together to change our mentality and habits towards how we use water. The drought is not an issue that can be conquered by environmental enthusiasts alone. Practicing water conscious habits is a necessity for all of us. Water Conservation is an invaluable way in which we can advocate for the well-being of both ourselves and others, including those of future generations. Water preservation can seem daunting, an extra task on your ever-growing list of to-dos. However, if you put in a little time upfront (to assess and implement healthy change), conserving water can become a regular and easy part of your everyday life. Take Quick Showers: Have trouble keeping track of time? Make a shower playlist and challenge yourself to finish your shower within one song’s length of time. Flush Less: If it’s yellow let it…well, you know how it goes. Turn It Off: Make sure to turn the water off so the faucet’s not running while your brushing your teeth. Also, instead of thawing food items by running the faucet until the water's hot, throw your food in the refrigerator overnight. Wash Efficiently: Only use the washing machine when it’s full. The fewer loads you run, the less water you use. Fix Leaks: Make a habit of annual plumbing and irrigation system checks. 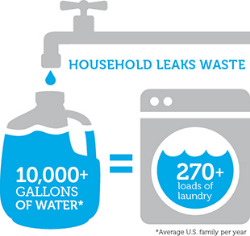 Little leaks in the home can lead to gallons of daily water loss. Invest in Less: In less water use, that is. Buying water-efficient products (shower heads, toilets and the like) can help you save both water and money. One way to determine if a product is water-efficient is by looking for a watersense label which indicates that the product has met U.S. EPA (Environmental Protection Agency) qualifications for "water efficiency and performance." Compost It: Add food waste to a compost pile instead of throwing it down the garbage disposal (which uses water). For more info on how to create a compost pile, click here. It's easy to think that our water supply is plentiful. For a large number of us, each time we turn on the faucet, hop into the shower or press against the lever in our fridge with a glass, water comes flowing out. Though plentiful is far from the case, there is something we can actively do to make a positive change. We can integrate water conscious habits into our day-to-day lives. We hope that the above tips will help you as you deliberately choose to be part of the solution; save water and live well.